The Pin You're "Never Going to Get"
Discussion in 'Disney Pin Discussion' started by Addicted to Alice Pins, Mar 14, 2018. I had been after this pin for YEARS, like since I have been pin trading in 2004 YEARS. Firstly, I actually don't like the pin, it's ugly, it has the same problem they have with Scar where they can't seem to color in his face the right colors... but I'm going for Robin Hood completest because I'm insane. Since I got back fully into pin trading back in 2014 (I took a break from like 2010 till then), I'd always JUST miss this pin on that auction site. It sells between $20-30 typically. But there are always listings for it at like... $90. Nope. It hasn't sold at that price either, but there's almost always one listed that high. Every time I'd put out trade requests on Pinpics if someone answered, they'd tell me how it's super rare and a $90 pin, and I'm just like nope, the sold listings put it at $20-30... everyone always wanted their $90 value. I've seen it at Disneyana a few times for $50, still too rich for my blood. I finally did get it on that auction site, at the price I wanted because someone listed him as "King Richard" ha. Kiragigi, Spr175psu, bookhugger and 1 other person like this. And this one always manages to slip through my fingers when it does pop up. TinyTink, Spr175psu, Addicted to Alice Pins and 1 other person like this. That's awesome that you did that! And it proves my point! Haha. They are each LE15 (15!!!!) 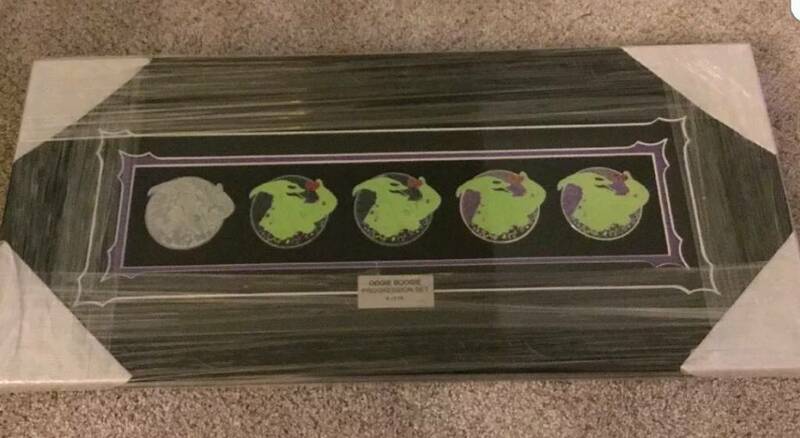 and come from a frame set with 46 other pins, which RETAILED for over $2,000 (which of course I don't have just sitting around for pins), but every person who I personally know who has acquired the frame got it specifically for these pins. Additionally, there is someone on Facebook who exclusively collects Inside Out (and now Coco) and scoops up any set of these that does come up for sale immediately. He posted a photo with three of these sets in it. So basically my only hope for getting these is that either someone who has a set decides to give up Inside Out or has a major emergency and sells to me directly (bypassing ebay and general Facebook groups), or a frame somehow pops up right after I get a huge windfall for some reason. Kiragigi, CCofRR13, Addicted to Alice Pins and 1 other person like this. A handful of Mulan pins will probably always be out of my reach, but the BT and the Designer for sure. At least the Disney Store has the Designer artwork on a lot of different merchandise, so I can just get a $20 coffee mug instead. bookhugger, coblj003 and Addicted to Alice Pins like this. I haven't been in the pin game as long as many other folks here, but this is one of the pins that I personally witnessed the value skyrocket in the blink of an eye. I'm still boggled. I bought one for $35 (new in original packaging) when it was released. It arrived with a little schmutz on it, so in my naivete I tried to clean it off. I was ... vigorous in my efforts, and Dinah lost her nose. Ha. Horrified, I bought another (the price had jumped to $40!) and threw the original one in the trash. I remember feeling so *decadent* for spending $40 on one pin! At that point, most of the older and harder to find characters in sorcerer hats were, like, topping out around $80. Once it was in my collection, I stopped paying much attention. Then, while doing a broad search sometime later, I saw that it had gone past $100. And then it kept going. And I still am amazed when I see one for sale somewhere with an asking price that is astronomically higher than what the original "secondary market" supported. I don't hate you. I do wonder what a nose-less Dinah would go for these days. But WHO KNEW then? At that point, a damaged Dinah would have netted, like, $15. I didn't know about the "long game." I didn't have any patience. I STILL don't have a lot of patience, but I see progress. Ha ha. But the Alice R/C *and* the Dinah sorcerer hat for less than $200 is pretty freakin' spectacular. Li, you know how to hustle! LOL, it was a few years ago too, when the Alice R/C was worth maybe $100. I already had it but there were some parts that were faded so when the lot came up (on DPF), I pounced. It came with a few other pins too. One set of those for one person is plenty. I hate when people do that. Spread the love, dammit. I share your pain from this set. 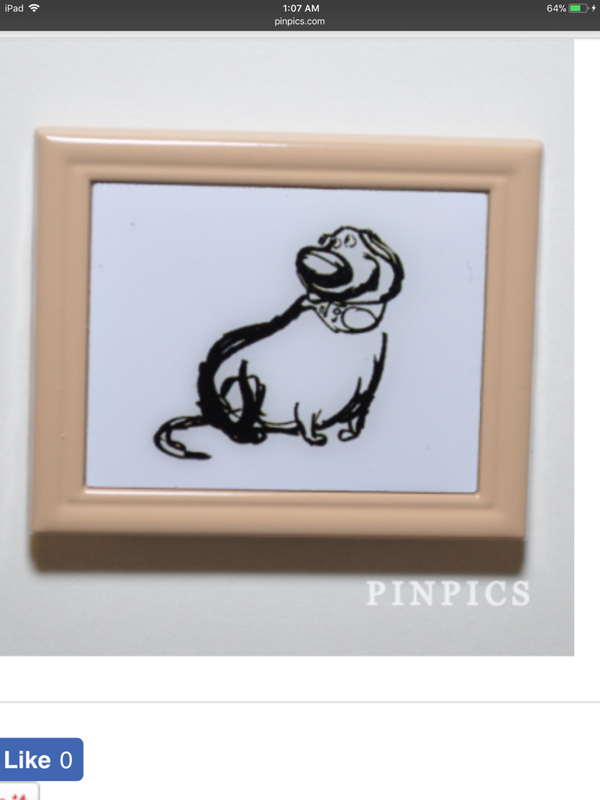 This is the final pin I need for Dug completist status. Aesthetically I don’t even really like the pin that much. It’s so blah. And the frames look like what was in my parents house in the 1980s. Oddly I do see the others from Up from this set pop up for sale. Usually around $175-$200. But never Dug. I’m really OCD for completist status but I really want to actually *like* a pin I might have to spend triple digits on. Incidentally, someone connected me with someone selling their Dug from that set. For $400. I waved goodbye to his dorsal fin as our conversation concluded. Ajk, Addicted to Alice Pins and AshleyV like this. I know who was selling those pins at cost when they first came out at D23. I regret not pouncing on Brave, UP, Incredibles. This x1,000. Ha. I will forestall an argument by saying, yes, I fully understand that people are free to do whatever they want (their money, their collection, their immortal soul ) but I do think we get spoiled by the kind and generous community we have here. There are plenty of folks who *would* think, "I have one of these and I know someone else who would LOVE to have one, too, so I'm going to help them get it" or what have you. That attitude is not universal, though, which can be frustrating. WHY DO YOU NEED THREE?! You framing a set each for your living room, bedroom, and bathroom? (In the case of the latter ... maybe be leery of trading in future. ) But oh well ... to each their own. Ajk, Kiragigi and watzshakinbacon like this. dear god why. I don't think my entire collection combined is worth that much. I mean, I love pin collecting as much as anybody but at the end of the day you're charging $8,000 for a small piece of metal. Disneychildwithin and Addicted to Alice Pins like this. Disneychildwithin, watzshakinbacon and Addicted to Alice Pins like this. It's worth a max of $2000. The "grading" makes people think it's worth more! Even 2000 is insane for an individual pin! Ajk and watzshakinbacon like this. Is this a surprise? I've never even seen it in person, but I've seen others in the series. If only I could get some of the heroines, I might be able to trade for it eventually... But that's a long shot. TinyTink and Addicted to Alice Pins like this. Yeah, I have these things called "bills" I have to pay. Addicted to Alice Pins, bookhugger and TonkaToy like this. Addicted to Alice Pins, chubs191 and Purplemandms like this. Yeah. I know she is. I couldn't convince my mom to buy the whole set when it came out (like a 3rd of a year's allowance at that point). So, I thought I could get it much later. I didn't quite think it would be 11+ years later, but I know I'll get her some day. Disneychildwithin, Addicted to Alice Pins and starry_solo like this. I thought most of those progression sets had dropped to around $500 each when I was watching them for a while - which, starting at $300 retail is not a terrible markup. Purplemandms and starry_solo like this.